Wendy Barnes is a wildlife artist creating sustainable lifestyle designs from original pen and ink drawings that she develops into fabrics and who gives back by donating a portion of proceeds to partnered conservation organizations. Wendy's background includes a bachelor’s degree in architecture from Northeastern University in Boston, MA, and a master’s degree from New York University in Real Estate Development leading her to a design career during which she was nominated for NYC Lobby of the Year, 2008 for IKON Condominiums, 50 Bayard Street, Williamsburg, Brooklyn. In 2015, Wendy moved to Melbourne where she works in wildlife conservation as Program Coordinator for Women of the Wild at Brevard Zoo. Wendy’s art soon became one with her conservation efforts, reflecting her respect for wildlife. Wendy Barnes Design creates stylish gifts which educate on the importance of wildlife conservation. 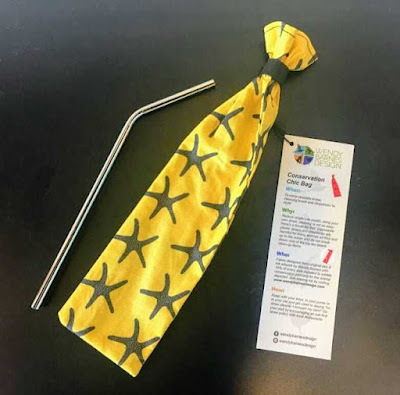 Knowing that many people donate to wildlife causes but have no way to communicate their love of nature, Wendy uses her talents to create textiles and produce retail and custom items including reusable straw cases, favor bags, cloth napkins and pillows. Her designs bring the love of wildlife into your daily life . 10% of every item sold supports wildlife causes. A free drawing for one of Wendy’s textiles, a drinking straw case in a sea star print will take place on Friday, August 17 during the Main Street Friday Fest in downtown Cocoa Beach . Developed in partnership with the Sea Turtle Conservancy, this light weight, washable case contains a reusable stainless steel straw.